Spray 3 1/2- to 4-quart slow cooker with cooking spray. In cooker, mix turkey, onion, carrot, celery, mushrooms, poultry seasoning, salt, pepper and water. Stir in soup and mixed vegetables. Increase heat setting to High. Cover; cook about 20 minutes or until thoroughly heated. Meanwhile, heat oven to 450°F. Remove pie crust from pouch; unroll on work surface. With 2 3/4- to 3-inch round cookie cutter, cut 12 rounds from crust, rerolling once; discard scraps. Place pie crust rounds on ungreased cookie sheet. Sprinkle each with about 1 teaspoon Parmesan cheese. Bake about 8 minutes or until pie crust rounds are golden brown and crisp. Immediately remove from cookie sheet to cooling rack. Top each serving of pot pie with 2 baked crusts. Substitute 1 1/2 lb boneless skinless chicken breasts for turkey, if desired. 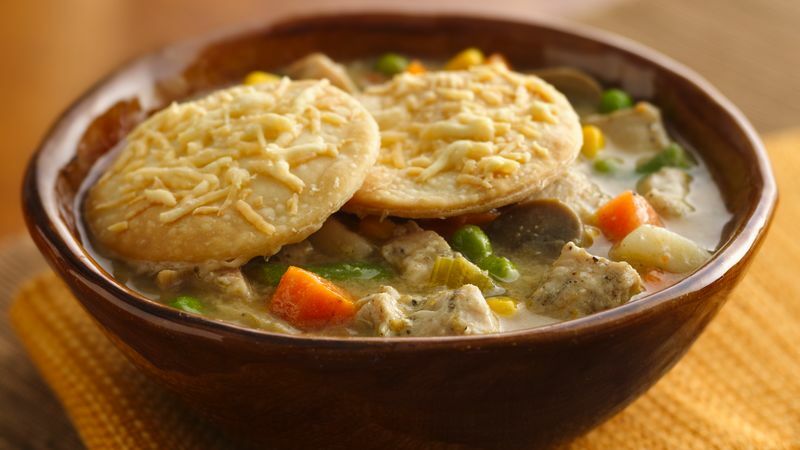 For a cheese-flavored pot pie, stir in 1 cup shredded Cheddar or Colby-Monterey Jack cheese just before serving.